You probably can't tell from the scan, but there's a pair of wheels under this extraordinary structure that allows it to roll down the boat ramp a few feet into the Lake of the Ozarks so that it's floating. This "houseboat" sports two enclosed stories and a deck on the lake side. It's fully wired for electricity that comes from the main house (at far right). Right of that house is the house I spent two weeks in in the Fall of 1995 with my sweetie at the time. My mom and I were riding on my motorcycle and stopped to get an ice cream. 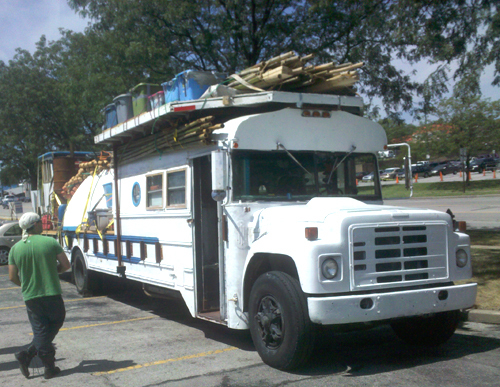 In the parking lot we found this extraordinary vehicle. From the front it looks like a standard-issue bus. You can even see the door on its right side. But behind that point you can see that is not at all a normal bus. For instance, it looks like there's a porthole several feet astern of that door. The operator of this extraordinary vehicle, Xander, is shown here casually examining it. From abaft of starboard you can see a nautical theme developing. Amidships you see what look like fishing nets, and at the stern you see what looks for all the world like a wheelhouse. And you see a big pole sticking out the back. Believe it or not, when disassembled and then quite differently reassembled, the bus above turns into the vehicle at right. 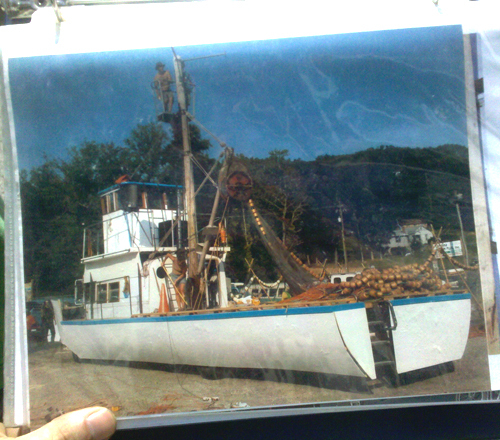 It is a working fishing boat. 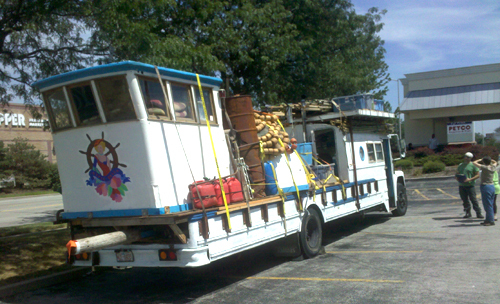 Imagine how long it must take to reconfgure the bus into a boat, and how long it must take to turn it back into a bus. Now imagine how long it must have taken to figure all this out.